I had been lounging in my study long enough for my evening cup of Lapsang Souchong to grow cold, when my granddaughter, Thalia, wandered in, the edges of her flannel nightgown dragging on the floor, and her battered copy of Favorite Grimm Tales in her hand. The story unfolded again, just as it did for me so many years ago. The princess cries by the well into which her golden ball has fallen. Up rises the frog to bargain with the helpless girl. For promises of kindness he dives down into the depths of the well to recover the ball. 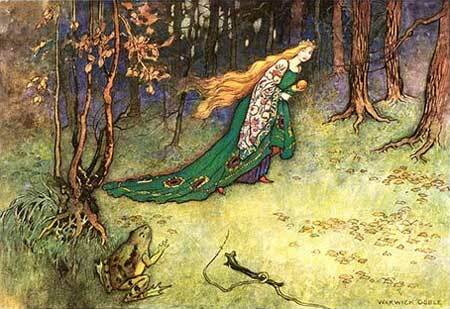 Thoughtlessly, the princess runs back to the castle, leaving the frog to his well. I felt, again her agony and embarrassment when the frog intruded upon the castle, demanding entry. Her father, the king, with moral authority, made her fulfill her promises. The frog wheedled his way into eating off of her plate, drinking from her cup, and then to sleeping in her bedroom. What! Where’s the kiss? I turned quickly to the title page. The words “Fractured Fairy Tales” did not appear anywhere. Surely this was a jest. Unperturbed by this miscarriage of justice, Thalia gave me a kiss goodnight and swished her flannel way out of my study. I grabbed my Jack Zipes’ translation of the tales and turned to its first story. There to my disappointment stood the wall and no kiss. After an evening of research (I didn’t get to bed until 3:00 a.m.—thanks Thalia), I uncovered the following facts. The kiss appears in none of the older variants. When it first appears is not clear, but Maria Tatar implies that it is of American origin. There are Scottish tales of this motif. “The Queen Who Sought a Drink from a Certain Well,” “The Paddo,” and “The Well of the World’s End.” The common element in these three is that the frog requests to have his head chopped off before transforming into a prince. Another wonderful variant, from Germany, is “The Enchanted Frog,” which is also a variant of the “Beauty and the Beast” story. The merchant father with three daughters, whose youngest wishes only for a rose, picks a rose from a beast’s garden. The beast is an enormous frog, who demands the young daughter as payment. This Beauty is not as noble as other Beauties, and when the enormous frog’s servants come for her, they drag her kicking and screaming from under her bed where she tries to hide. The frog’s song lulls her and she allows him into her bed. It is not until the English version of this story, taken from Grimm but altered by Edgar Taylor, that we have a kinder and gentler ending. It is not uncommon for twentieth century versions of fairy tales to have the violence edited out. Taylor’s book appeared in 1823, not ten years after the Grimms’ publication. I went to sleep that night, to dreams fill with amphibious images, and awoke in the morning with this conviction. All these antique variants, reaching back to the Middle Ages, devoid of the kiss, have no standing with me. They are simply un-American. I am sitting by a well. This might be in Wales. It could be in Scotland. I am not waiting for a frog to rise up from its depths. It’s not that sort of well. It’s a spring really. There is a stone wall built around it, but the water bubbles to the surface; I can see the bottom. From where I sit meadowland slopes gently upward. By the well grows an ancient thorn tree covered in bits of rag tied to every branch. I know the meaning of these strips of cloth. They were left by visitors who came to partake of the healing powers of these waters. The rags are offerings, tokens, talismans, left behind as a plea to, and in honor of the spirit of the well. Rags hung in trees, or bent pins thrown into the water, serve to heal aches, sores, and malaise. The practice comes out of pagan beliefs, but most healing wells have been assigned a Christian saint and continue on with their healing nature. The wells in fairy tales are of a different order. Fairy-tale wells are deeper. There is a healing well in one of the Grimm stories, “The Water of Life,” in which the three sons of the king seek the well of the Water of Life to heal their father. The eldest sons fail in what the youngest achieves, finding the well in a mysterious castle with the aid of a magical helper. There are no bits of rag around this well. In “The Queen Who Sought a Drink from a Certain Well,” the daughters are sent out, one by one, to the True Well to bring back healing water for their mother. The well’s guardian, the frog, wants them to marry him in return for the water, to which only the youngest agrees, then tries to avoid the bargain. The matter is settled when she cuts off his head and he transforms into a prince. I am sure there are other stories with healing wells to be found, but more frequent are young ladies sent off on the impossible task of getting water in a sieve. “Well of the World’s End,” “The Maiden and the Frog,” and “The Horned Women” being three of these. The traditional solution to the problem of carrying water in a sieve is to stop the holes with mud and moss, an unusually practical answer in a world of magic. Other more ominous wells include the one into which two children fell and were snatched up by a nixie. Then there is the dry well of a witch who abandons a poor solider there when he does not cooperate in retrieving her blue light. In one version of Tamlane, Burd Janet casts her lover, who is in the shape of a flaming sword, into a well, thus breaking the spell put upon him. Only in our tale of “The Frog King, or Iron Heinrich,” does the golden ball appear, a mere toy, even if made of precious metal, which falls into a well. No sieve, no healing water, no high stakes. That this child, playing with a toy, is a day away from becoming a bride makes this story almost unsettling. She takes them into her lap, combs their hair with a silver comb, and lays them on a primrose bank. For these courtesies they grant her three boons. I hope for a little luck myself. I cast a copper coin into the well and make my wish. It is the wish I always make, but one day it may come true. Who is Heinrich, or more to the point, from whence does Heinrich come into the story, “The Frog King, or Iron Heinrich”? The title would cast him as a central figure in the story, but this is not the case. 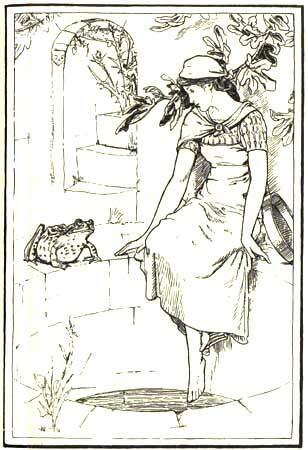 After the princess has thrown the frog up against the wall, the creature transforms into a prince, who explains to her that in the morning he will take her away to his kingdom. At sunrise a team of eight white horses decorated with ostrich plumes and gold chains arrives drawing a coach. Riding on the back is Iron Heinrich, the young king’s faithful servant, who, we are told, when the prince was turned into a frog had three iron bands wrapped around his heart to keep it from falling apart with grief. 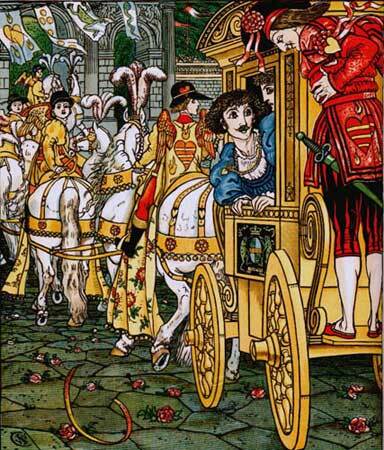 As they drive off to the prince’s castle, three times the prince hears a noise that causes him to think the carriage is breaking, and three times Heinrich tells him it is the bands of iron snapping as his heart swells with joy. This add-on to the end of the tale has a pleasant ring, but hardly warrants being part of the title. Heinrich is an incidental character, having nothing to do with the inciting incident, the arc of the story, or its climax. Nor does Iron Heinrich appear in any of the other versions. From whence does Iron Heinrich come? Out of Wilhelm’s head, and proudly he made it part of the title. The two eldest sisters will not consent to the amorous frog, but the youngest does. That evening the frog comes at her door. She keeps her promise and on the morning of the third night the spell over the frog is broken. The Grimms’ notes then refer to a third version in which the prince departs, leaving with his betrothed a handkerchief with his name written in red. If the name turns black, he is either dead or unfaithful. When the name turns black, she and her sisters disguise themselves as soldiers and join his army. They end up riding behind the prince’s coach when he is about to marry a false bride. The prince hears a noise and declares there is a problem with the carriage. The true bride tells him it is the sound of her heartstrings breaking. On the third sound he finally recognizes her despite her disguise and marries his true bride. Wilhelm may have gotten the character of Heinrich from the sixteenth century writer, Georg Rollenhagen and his Old German Household Tales. The Grimms’ notes are cryptic and confusing on this point. I can’t find an English translation of Rollenhagen’s work, but the tale appears to be about a war between the frog and mouse kingdoms. Do my suspicions about Wilhelm messing with the story matter? Not much. Perhaps I am on the trail of one of the changes made to this story, but what about the kiss? Who changed that? The Grimms liked to put snatches of rhyme into their stories. Let me put one into my blog. “Stories keep changing, as stories will do. It happens by chance; it happens on cue. Somebody changed it; had to, you see.